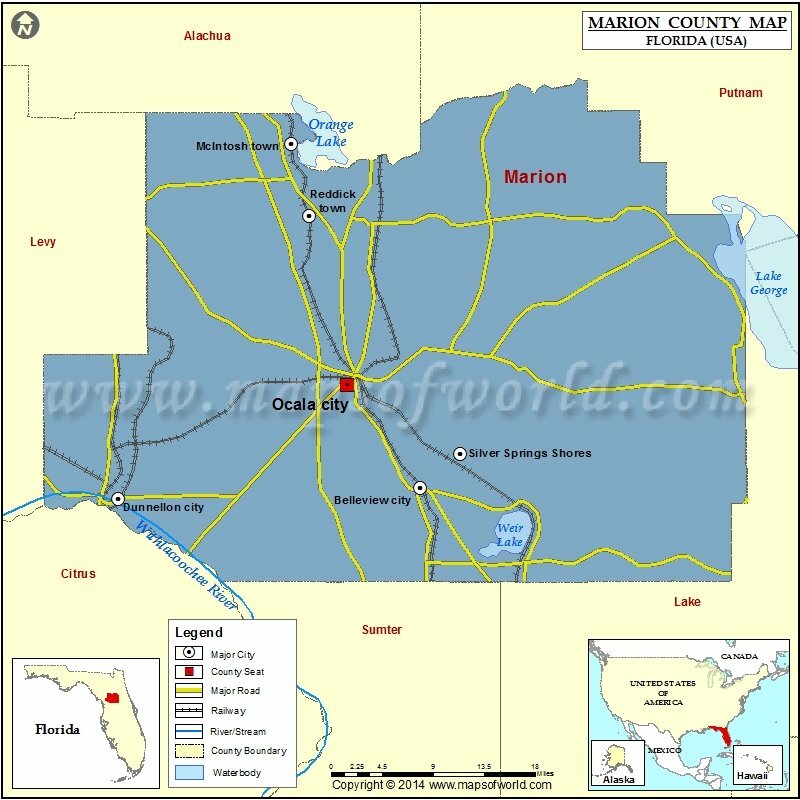 Founded in 1844, Marion County is located in north-central Florida between the Atlantic and the Gulf. The county is named after General Francis Marion, who served in the American Revolutionary War. Its county seat and the largest city is Ocala. Covering a total area of 1,663 square miles, Marion County features rolling hills and live oaks and pines. The county lies within a two-hour drive from major cities in Florida. Putnam, Volusia, Sumter, Lake, Citrus, Levy, and Alachua are adjacent counties. The Ocala National Forest covers most of the eastern portion of the county. Popular among nature lovers, the scenic Florida Trail passes through this forest. Silver Springs, which is state's first tourist attraction, is famous for glass-bottom boat tours that allow views of underwater flora and fauna. Recreational activities here include bicycling, canoeing, and camping. The Appleton Museum of Art showcases permanent collections of European, American, and Contemporary artworks. The Don Garlits Museum of Drag Racing houses vintage hot rods and is popular among sports lovers. Fort King National Historic Landmark, Lake Weir, and Silver Springs Nature Park are other local attractions to visit. Ocala International Airport (OCF) is the primary airport for general aviation. Interstate 75 and US 441 run north-south through the central part of the county.